Enter your email address and tap Send Email. 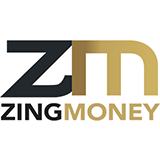 From your mobile device, open the email from Zing Money. Enter your email address and new password. You're good to go! If you run into any problems, give us a call at 844-954-9273 or send us an email at support@zingmoney.com.